Two years ago, NMB Bank introduced NMB Wakala services to reach out to both the banked and unbanked communities across the country. Since then it has become an exceptional platform in advancing financial inclusion by taking banking services closer to Tanzanians. According to NMB’s Chief Executive Officer Ineke Bussemaker, branches have traditionally been the norm when people seek to access financial services, however NMB identified a gap in the economy when it came to servicing the unbanked population. Tanzania is a cash based economy and there is an untapped market of Tanzanians, who are economically stable, yet who do not have access to a bank account. The NMB Wakala network complements the branch network by delivering banking services closer to NMB customers. The NMB Wakala agents are easily visible and offer a host of convenient services such as cash deposits and withdrawals, balance enquiries, loan repayments, school and college fees payments and utility payments to name a few. More importantly these services are offered outside traditional banking hours, making banking easily accessible and convenient. NMB currently boasts the largest branch network in the country with over 218 branches and more than 750 ATMs. Their goal is to expand their outreach through growing their wakala network. At present they have the largest wakala network in Tanzania. From 2016 – 2017 they increased their wakala network from 785 to more than 6000. It is their intention to reach the 10 000 mark by the end of the year. On a recent investee trip to NMB last month, the Arise team had an opportunity to visit Kariakoo in Dar es Salaam, one of the busiest markets in Sub- Saharan Africa. They gained first hand insight into how the branch and wakala networks have made finance convenient and accessible to all. The team also met with two of NMB’s Small Medium Enterprise (SME) clients, who have significantly grown their business because of the loans and support provided by NMB. NMB’s vision is to become the preferred financial service provider in the country. “We have over the years evolved our banking services through our extensive branches and ATM networks. The bank has further invested in technology solutions to better address customer needs through innovative digital distribution channels such as NMB Mobile which provides mobile banking services. As a bank we strongly believe, that we will be able to reach many Tanzanians in a more scalable and cost-effective ways through digital solutions. 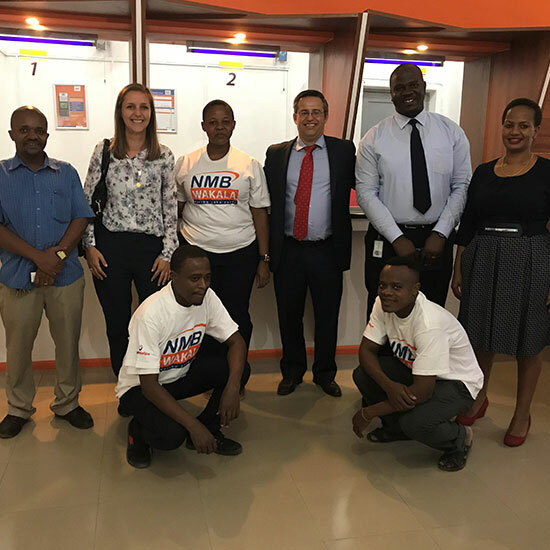 It is within this mission that NMB Wakala adds to the bank’s vision of consistently being the preferred financial services partner for every Tanzanian”, concluded Ms Bussemaker.